Teams will start out with the basic chili necessities (the meat and tomatoes, if you will). Ye Olde General Store is open for teams to purchase more ingredients. But teams had better leave their inner-bandito at home. The sheriff keeps a watchful eye and doesn’t take too kindly to sneak-thievin’. Teams can also negotiate with the hombres from other teams for those last minute needs. But no tusslin’. Sheriff’ll ride you right out of town for that. 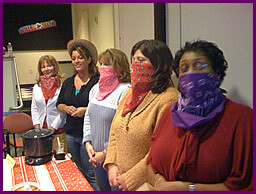 Quixote Consulting’s Team Chili Cook-Off culinary team building activity is both hot and chili con cool! An optional debrief can be led by a trained facilitator around recognizing team strengths. Team Chili Cook-Off is great because it’s as flexible as a walkin’ whisky vat is balled up. This hoe-down can be done with anywhere from 8 to 800 people! 90 minutes to 3 hours. The program can also be the culmination of a full day of Collaborative Team Quest teambuilding or incorporated into a day or multi-day program using work-style assessments such as MBTI or StrengthsFinder. A room large enough for a table for each team to use a portable stove, chop up ingredients, and get cookinï¿½! Large groups can be gather in a ballroom or outdoors.